Offering great food, first-class accommodations and the best sportfishing on the east coast! 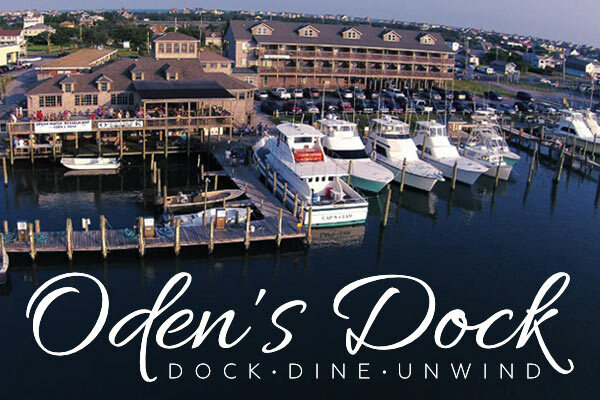 Located in the heart of Hatteras Village, NC, Oden’s Dock has been serving those working or enjoying the waters of the Outer Banks for decades. Oden’s Dock has been family owned and operated for generations. Current owner Dan Oden is the 4th generation of the Oden family to run the marina. He oversees the operation of the dock, inn and restaurant. Oden’s Dock is a true full-service marina, offering commercial and recreational access to the waters around Hatteras Island, as well as many amenities. Services include boat docking and slip rental with electric/water hookups, charter fishing, head boat fishing and cruises, a fully stocked Ship’s Store and an on-site inn and restaurant. We book both inshore and offshore charters and two head boats operate from our marina, The Miss Hatteras and Cap’N Clam. There’s also a seafood market, Risky Business Seafood, providing fresh local seafood and fish cleaning services. To top it all off, parasailing and sightseeing tours are also available. The Breakwater Inn was built in the 1960’s to accommodate fisherman and visitors to Hatteras Village. Today, the original building still serves as the “Fisherman’s Quarters”, offering modern rooms and amenities to Hatteras fisherman. In 2005, the sound-front building was added to offer additional rooms and amenities to our visitors. Stationed just above the Ship’s Store, The Breakwater Restaurant at Oden’s Dock offers great food with a great view! The menu offers something for everyone, and you can enjoy your meal overlooking the marina and beautiful Pamlico Sound.